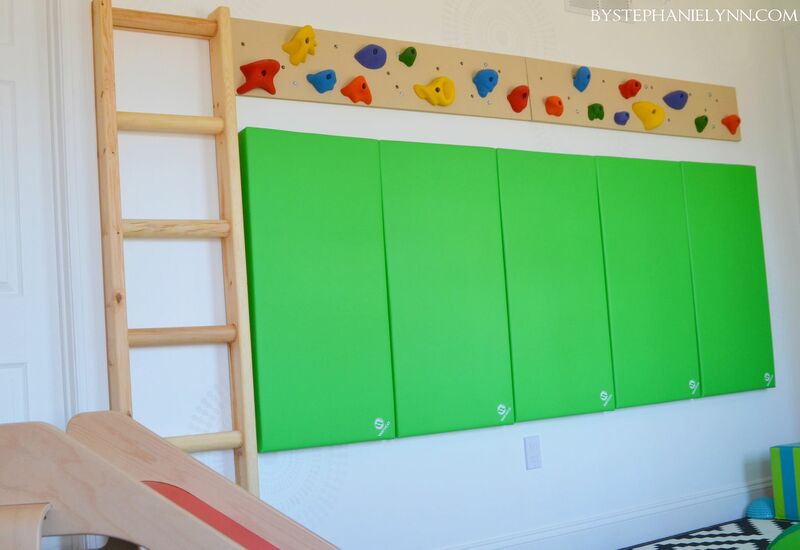 Yesterday I shared the indoor rock climbing wall we put together for CJ’s sensory playroom. While the wall has been used tremendously since it was originally installed, it wasn’t until a couple weeks ago that we had the idea to add-on an access ladder. 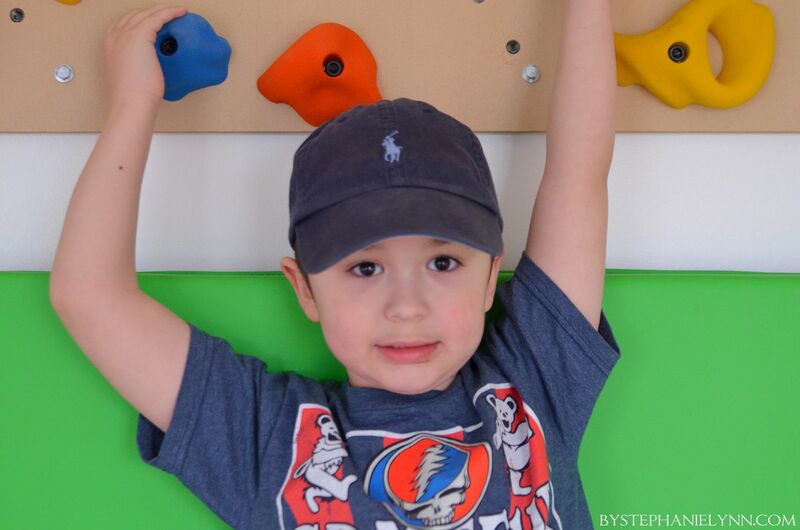 We decided on a partial climbing wall mainly to address CJ’s therapy needs. 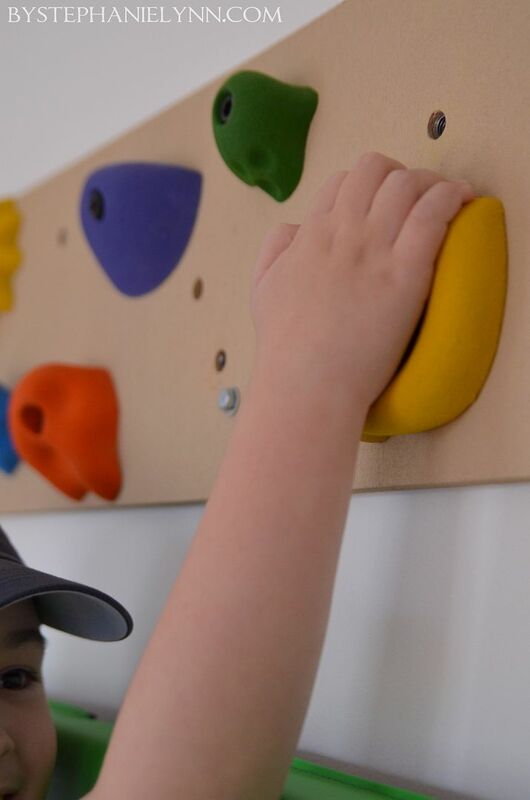 As our little guy has become stronger and a bit more confident, random objects have suddenly started to appear in front of the wall – used as stepping stools to get to the holds when we are not directly working on exercises. 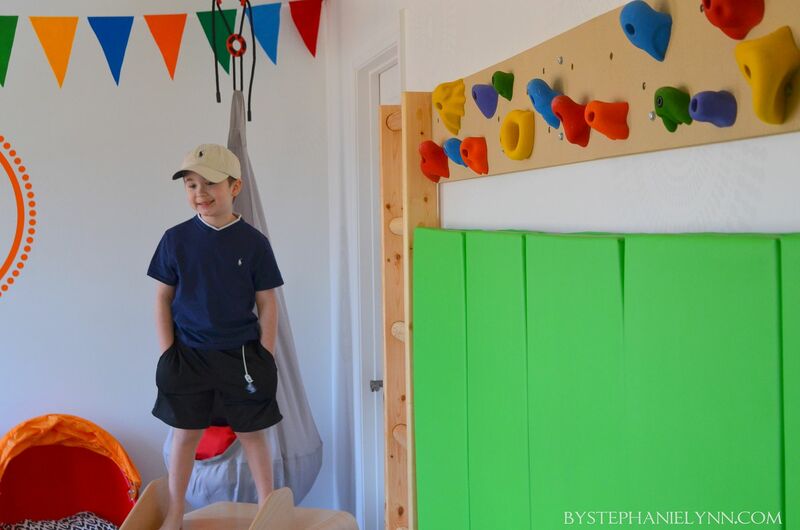 The ladder not only allows him access to the climbing wall, but serves as an additional strengthening obstacle in itself. 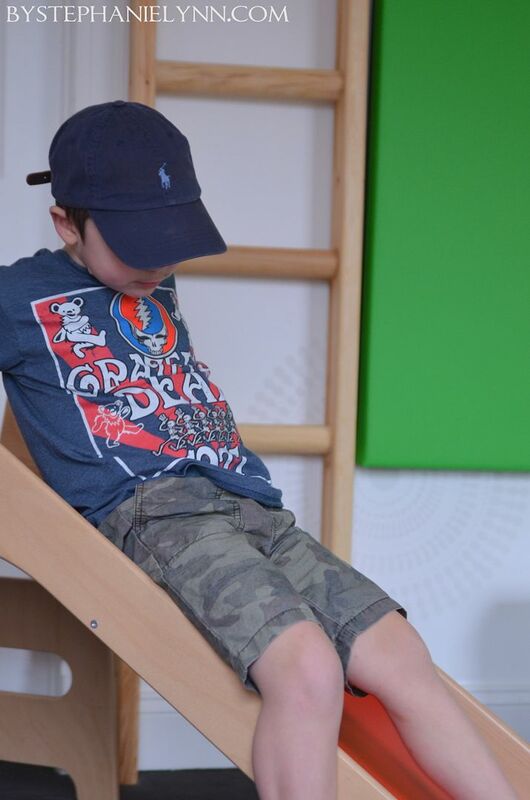 So it’s a win, win and a good thing – as it only means our little guy is progressing and building up his tone. Since we didn’t want to move or adjust anything that was already installed and in place – Butch put together some simple plans to build a ladder to perfectly fit the space we had. 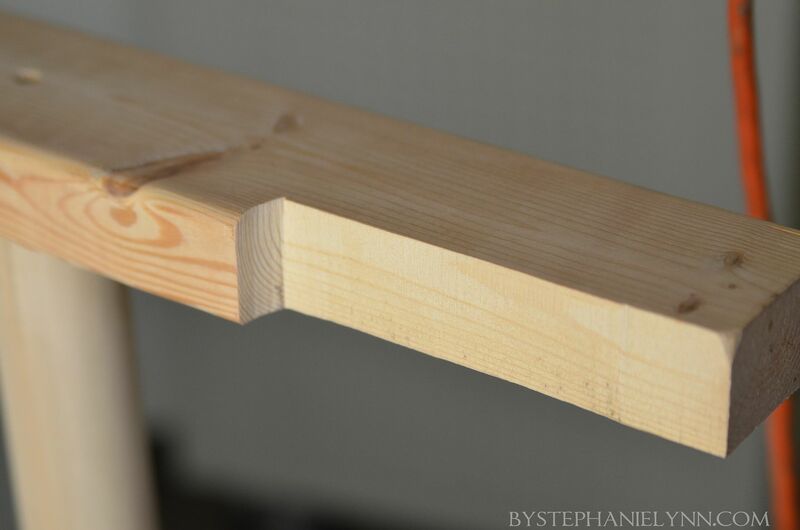 We began with two 2X4’s – used as the side rails for our ladder. 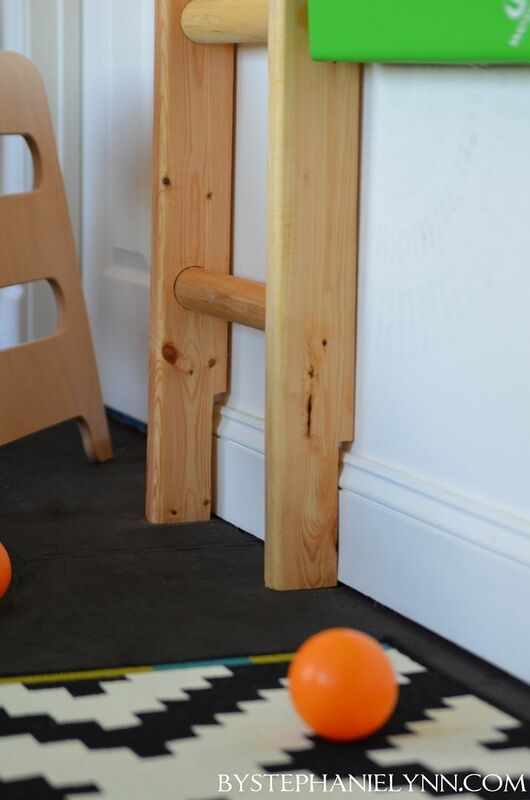 Both were cut to length to fit the climbing wall. We decided to use dowels for the ladder treads, so Butch mapped out the spacing on the 2X4’s and drilled each marking with a hole saw bit. 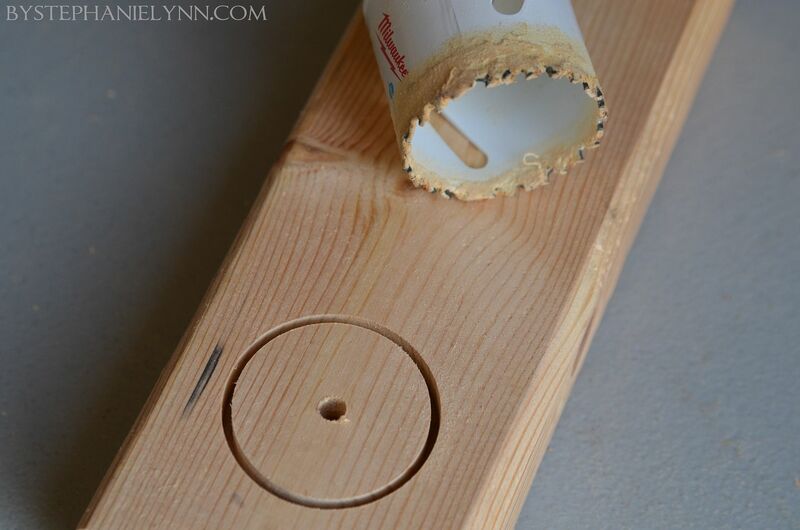 To create a pocket for each of the dowels to sit – the hole saw bit was drilled just a 1/2 inch deep into the 2X4 – then the center was chiseled out. Once all of the pockets were created on both 2×4’s the dowels were cut to length. 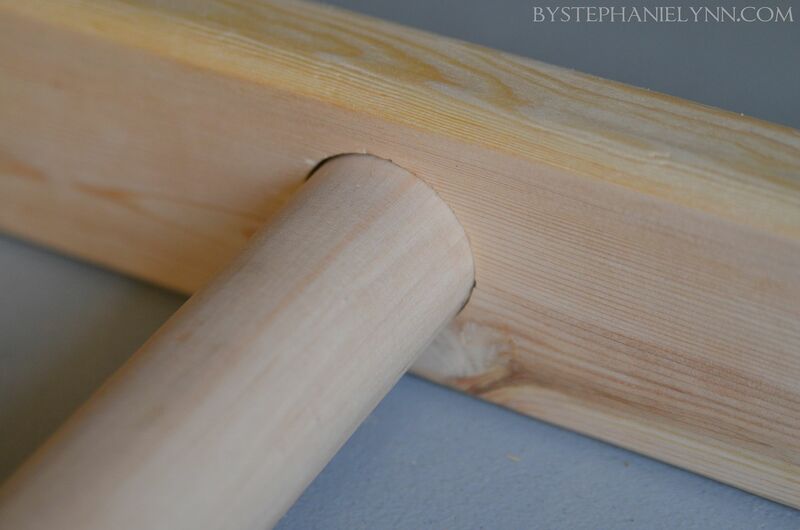 The dowels were then lined up and inserted into the pockets – along with a generous amount of wood glue. 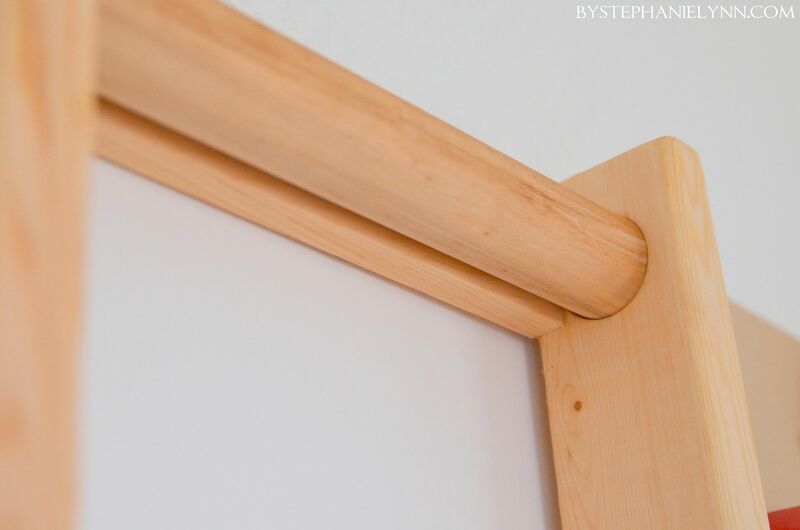 To further strengthen the dowels, and prevent them from spinning, wood screws were screwed into the dowel from the outside of the 2X4 as well. Note: pocket holes were used so they could be filled with stainable wood filler. 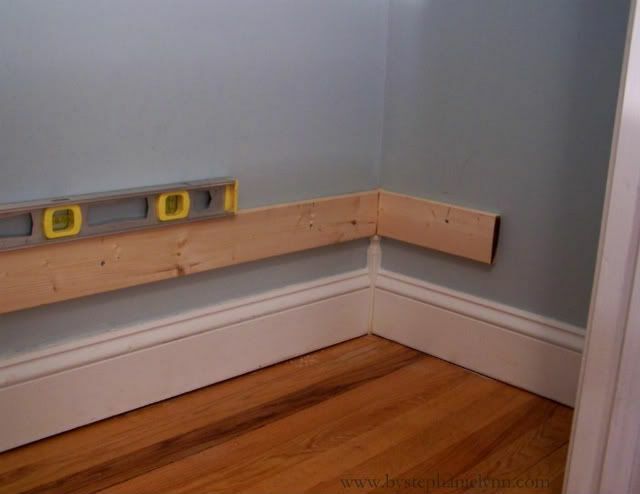 The bottom of the ladder rails were then notched out to sit flush with the baseboard molding. A piece of scrap wood was also attached to the top and bottom tread, for mounting, as shown below. 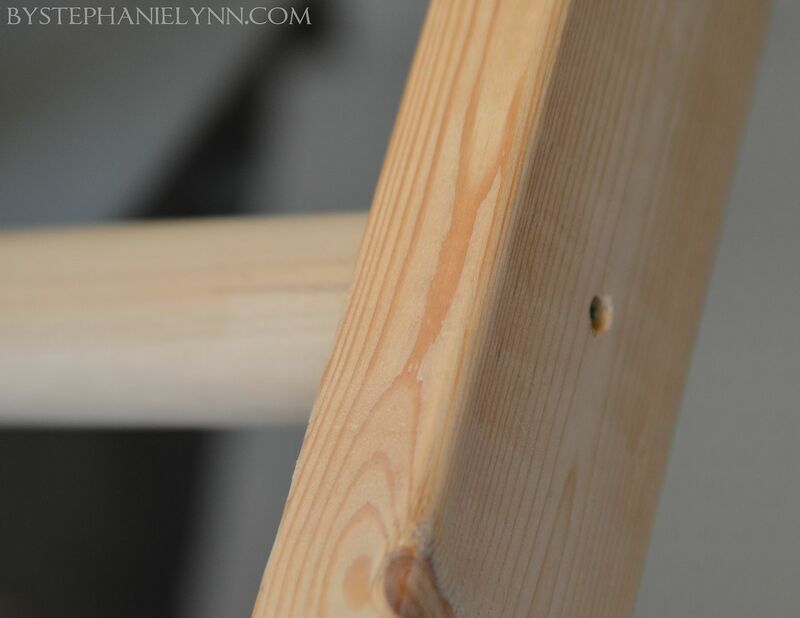 The entire ladder was then completely sanded smooth and stained with natural wood stain. 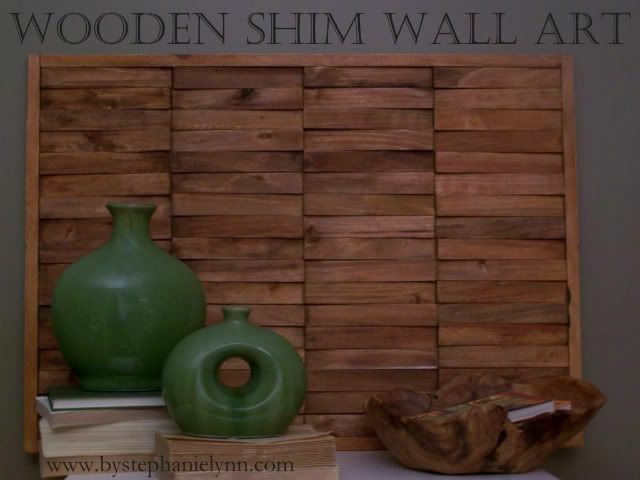 Here is that extra piece of wood I mentioned above. Since the wall stud is in the center of the ladder, Butch glued and screwed a piece of wood to the top and bottom tread to serve as a mounting base. Metal L brackets were then bolted to the wall stud and attached to these extra pieces of wood to secure the ladder in place. Above you can see the notched areas to accommodate the base molding. I tried to get some action shots but got a silly boy instead. Very cool. You’ve set up an awesome space for your son. I want to follow your blog but on my feed reader all i see is the title of the post. Is that how its supposed to be? I wish I could see a picture and read part of the post so I could decide if I want to come to the blog to read the whole post. I just figured out how to get my feeds on my email program so I am excited and loaded your feed. whowww, what a great playroom. LOVE IKEA!!! Thanks for sharing. 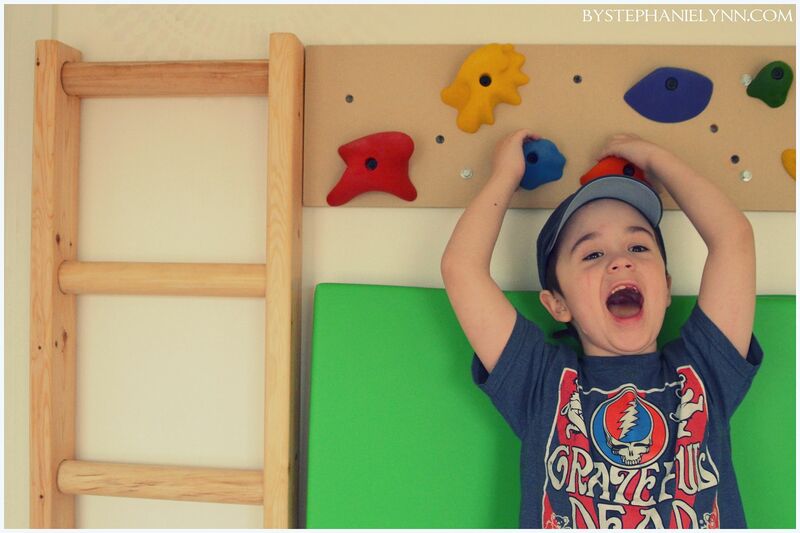 so cool to see parents invested in their child’s sensory needs! You are very creative and I’ll bet CJ has a blast. Does he share the space with his cousins or friends and how does that go? 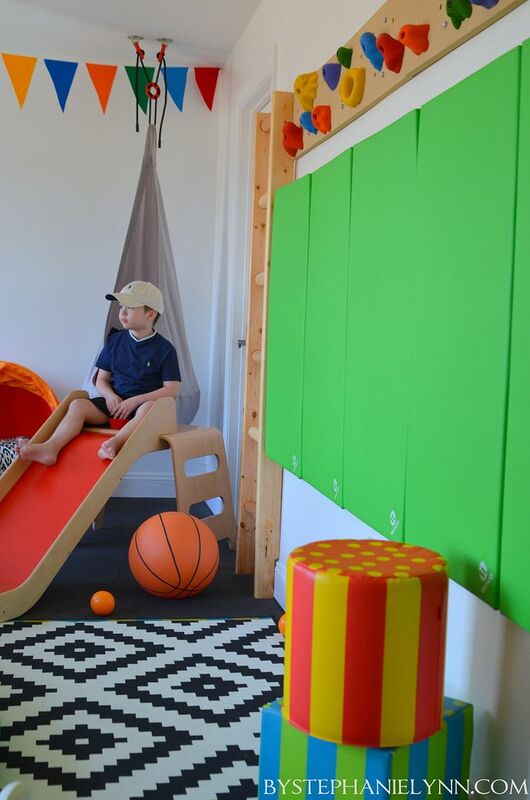 Cool playroom! My kids would love to have this one. This is heaven for a little kid. What a beautiful, functional, fun room for you guy. We also have a little guy with Autism and have made our garage into our sensory room. I am always on the lookout for great fun equipment to add. Where did you find yours? I’d love to see your sources. I tried searching your site, but couldn’t find any posts on it. I understand if you haven’t had time to post, but when you do, I can’t wait to see! He’s so lucky to have such wonderful supportive parents!